The Rule of Law in Armed Conflicts (RULAC) Project is an independent project of the Geneva Academy of International Humanitarian Law and Human Rights.  Any views expressed on this website are not necessarily those of the Geneva Academy of International Humanitarian Law and Human Rights, or of any other body or organisation connected in any way with this website. The use of particular designations of countries or territories, the list of border countries and territories, as well as the maps included in this website, does not imply any judgment by the RULAC Project, the Geneva Academy of International Humanitarian Law and Human Rights, or any other body as to the legal status of such countries or territories, of their authorities and institutions, of the delimitation of their boundaries, or of the status of any countries or territories that border them. Further, the RULAC Project specifically disclaims any liability in connection with external sites to which it provides links. Their contents and the documents therein reflect solely the views of their authors. Likewise, the link to any external site does not imply that the authors of those sites endorse in any way material presented on the RULAC website. The RULAC Project and the Geneva Academy of International Humanitarian Law and Human Rights disclaim all and any liability for any loss or damage, howsoever caused, in connection with using this website.